The Soul from Flying Wings is the latest high end sport kite designed for competition free-style performances and true precision. Constructed completely from 100% light weight Icarex material with durable mylar and dacron reinforcements and framed in hand wrapped Dynamic Carbon Fiber rods, the Soul is a kite that can compete with the best of kites on the market and will allow you to grow with your abilities. We had the opportunity to Demo one of the Flying Wings Soul's at our local field, allowing all of the pilots in our area discover this awesome kite. We sent our demo kite home with one of the pilots who didn't get a chance to fly it during our local fun fly and here is a copy of the review that was submitted to us from him after he had the chance to fly. The Flying Wings Soul flew much better than expected. Fills sail nicely. Capable performer. Surprising high and low wind range performance. To be completely honest, I wasn't expecting to like the Soul very much based on comments I'd heard from others. However, it won me over. When I showed up at the field I anticipated flying it for a half hour or so then pulling out one of my other kites (nirvana, deep space, quantum pro, etc) but instead I found myself with the Soul for the rest of the evening, well into the night (at our lit field). At each turn I was pleasantly surprised with the Soul. My first flying impressions were rather ambivalent towards the kite, but this wouldn't last long. In the first 15 minutes I moved the bridle setting on the upper outhaul using the factory knots to the setting which leaned the nose of the kite farthest away. The kite also comes with two sets of outer standoffs, one shorter than the other. The longer of the two matching the inner standoffs. When I got the kite the shorter ones were installed but I quickly moved to the longer pair. The reasons for my adjustments were because the kite felt a bit loose in the air. It fluttered about without much feedback through the lines, with a behaviour which I describe as bouncing off the air. It would tug at the lines one second then no pull the next. The bad news is Las Vegas has perpetually bumpy winds which can bring out the worst in a kite. The great news for the Soul though is that with the adjustments mentioned the attitude of the kite totally changed, able to deal with the bumpy winds gracefully. Once finding the proper adjustment for wind conditions the Soul's sail filled nicely, providing a solid feel on the end of the lines. The bump and bounce went away and it became easy to tell what the kite was communicating. There was a nice, even steady pull on the lines. The Soul will fly clean straight lines, and turn promptly when asked without any over steer. In addition to flying well, the kite stalls well also. Snap stalls were precise and controllable, and side slides smooth and stable. In terms of precision, the kite is very predictable. 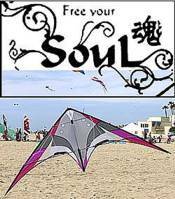 The Soul, for a kite with a full eight foot wingspan, fly's freestyle very well. It would fly to the limits of my capabilities without much trouble. Backspins, jacobs ladders, flic flacs, 540's, slot machines, rollups, and clean half axels were all easily there. With a bit more time on the kite, I feel cometes and wap-do-waps as well. Both are tricks I managed with the kite, just very dirty. However both are tricks I still need plenty of practice on. One basic function the Soul performs very well, which leads to many other tricks, is that it transitions very well into a fade. I'd go so far as to say it's a strong point of this kite. Since so many tricks require you to fade the kite somewhere in the trick, it's an important one to get (it) right and the Soul does it particularly well. The Soul also sits in the turtle position where it's easily recoverable. Many kites out there can get themselves into a turtle which at least given my capabilities, exhibit a behaviour which to me seems like a bored cat. Once a bored cat turns away from looking at you, it may be possible through an aggressive overture to regain its attention but it quickly returns to ignoring you. Kites like this float back to the ground in the turtle position before I can regain flight. I'm pleased to say the Soul is not one of these kites. The nose sits just deep enough to provide a great level of control in the turtle. Utilizing the shorter standoffs, for the first time ever I managed a rising turtle. A manoeuvre which the shorter standoffs seem to be supplied specifically to enable. After having moved to the longer standoff, while not able to get a rising turtle, control in the turtle position was still easy and predictable. I've flown more expensive freestyle kites from bigger name companies whose kites don't turtle as well. When the wind picked up the Soul gained some forward speed, but the amount of pull remained reasonable, positive, but not overpowering. The frame felt sturdy, without any appreciable flexing. On the other end of the spectrum the Soul stayed aloft into ultralight territory, remaining trickable in what I would guess to be 3-5mph. The effort Flying Wings has put forth with the Soul is evident in its construction details. All the usual snag points have been covered including the upper and lower leading edges, nose and standoff connectors on the back of the sail are all smooth. The nose is particularly smooth in the example I flew. Tip wraps were still occasionally an issue, not because of the snag points but rather the shape of the kite itself keeps the wingtip pointed away from you on the ground instead of pointing straight at you. It doesn't mean you'll have to walk to the kite to clear it, but you might spend a little more time clearing it than on some other kites. Another nice touch in terms of construction detail is on one particular section of the bridle, there's a piece of clear tubing. It appears to be in place to eliminate wear on the lower spreader from the bridle rubbing on it. The Soul also comes with double yoyo stoppers on each side, which also prefer to point towards the rear of the kite, freeing the leading edge for tip drags or reducing the possibility of shearing off a stopper in an aggressive ground recovery. I'd like to have seen a more positive method for tensioning the leading edges than the old tie it yourself method. The nocks have a knot recess in them and would be nice if they were used. Instead the instructions say to just make it all taut and put an end cap over things. I tied my own knots and fit them into the nocks. The leading edges are sewn with a straight seam instead of a multistitch zig zag or serpentine stitch like most other kites. I don't know if this would be an issue over the long run, but it's different enough from the norm to be mentioned. Flying Wings is known for poor standoff connectors at the sail and the Soul is no different. Otherwise the construction is well done, including extra Mylar and Dacron reinforcement under the nose. Overall I was very impressed with the Flying Wings Soul. It gets into and holds a fade as well as any kite I've flown. It was more entertaining and capable than expected and a quite fun to fly. More time with the Flying Wings Soul is something I'm looking forward to. Thank you Darren for writing this review for us. I hope it helps anyone looking to get one of these excellent kites.